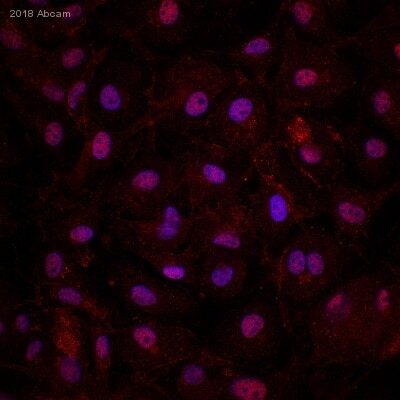 Rabbit polyclonal VE Cadherin antibody. Validated in WB, IP, Flow Cyt, ICC/IF, In-Cell ELISA and tested in Mouse, Chicken, Human. Cited in 92 publication(s). Independently reviewed in 36 review(s). Synthetic peptide corresponding to Human VE Cadherin aa 750 to the C-terminus conjugated to keyhole limpet haemocyanin. WB: HUVEC Cell Lysate. ICC/IF: HUVEC cells. IHC-P: Mouse heart tissue. Flow Cyt: REH B cells. IP: HUVEC whole cell lysate. Our Abpromise guarantee covers the use of ab33168 in the following tested applications. ICC/IF Use a concentration of 0.1 - 1 µg/ml. Abcam recommends using this product with confluent cells. WB Use a concentration of 1 µg/ml. Detects a band of approximately 115 kDa (predicted molecular weight: 87 kDa).Can be blocked with VE Cadherin peptide (ab27462). Abcam recommends using BSA blocking with this product. Milk blocking will give a greatly reduced signal strength in WB. Cadherins are calcium dependent cell adhesion proteins. They preferentially interact with themselves in a homophilic manner in connecting cells; cadherins may thus contribute to the sorting of heterogeneous cell types. 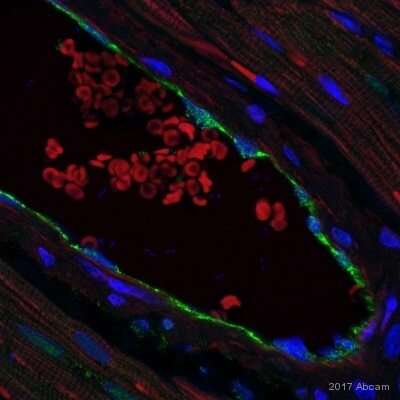 This cadherin may play a important role in endothelial cell biology through control of the cohesion and organization of the intercellular junctions. It associates with alpha-catenin forming a link to the cytoskeleton. Phosphorylated on tyrosine residues by KDR/VEGFR-2. Dephosphorylated by PTPRB. Cell junction. Cell membrane. Found at cell-cell boundaries and probably at cell-matrix boundaries. This blot was produced using a 4-12% Bis-tris gel under the MOPS buffer system. The gel was run at 200V for 50 minutes before being transferred onto a Nitrocellulose membrane at 30V for 70 minutes. The membrane was then blocked for an hour using 2% Bovine Serum Albumin before being incubated with ab33168 overnight at 4°C. Antibody binding was detected using an anti-rabbit antibody conjugated to HRP, and visualised using ECL development solution ab133406. The band we observe at 115 kDa is believed to be the glycosylated form of the protein. Observed band size: 120 kDa why is the actual band size different from the predicted? 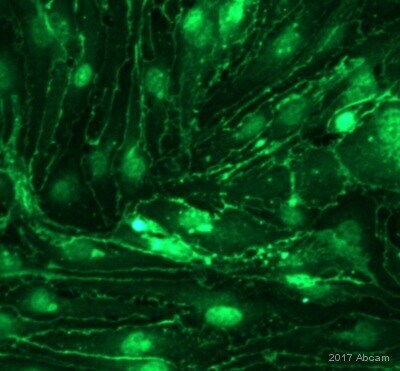 This image was generated using confluent cells. 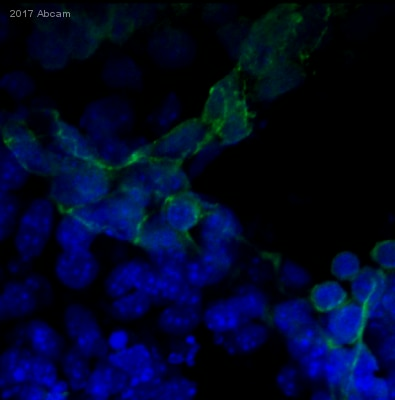 ICC/IF image of VE-Cadherin staining on HUVEC cells using ab33168. The cells were incubated with the primary antibody (ab33168) and the secondary was FITC conjugated anti-rabbit used at 1:400. The cells were incubated with only the secondary antibody as a negative control. Flow Cytometry - Anti-VE Cadherin antibody - Intercellular Junction Marker (ab33168)This image is courtesy of an anonymous abreview. ab33168 used in Flow cytometry. Human REH B cells were fixed in paraformaldehyde and permeabilized using saponin. Primary antibody used undiluted (2µl in 100µl of cells in PBS) and incubated for 15 minutes at 4°C. 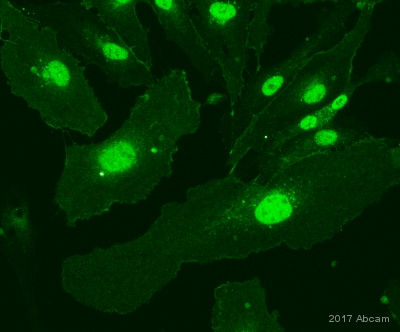 The secondary antibody used was an undiluted, Alexa Fluor®488 conjugated goat anti-rabbit IgG. 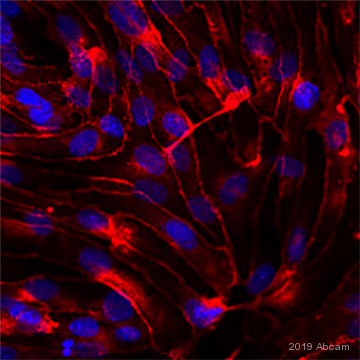 ICC/IF image of VE Cadherin stained HUVEC cells. The cells were incubated with the antibody ab33168 at 1/150 (Green). The cells were also stained with Rhodamine phalloidin (Red). Observed band size: 115,117 kDa why is the actual band size different from the predicted? The observed band for Cadherin 5 has a higher molecular weight of 115kDa due to glycosylation of the protein. The immunogen used to raise this antibody has 89% homology with Cadherin 18, 88kDa , which we believe is the additional observed band at 117kDa, again due to glycosylation of the protein. ab33168 Immunoprecipitating VE Cadherin in human HUVEC whole cell lysate. 1000000 cells lysate was incubated with primary antibody (1/100 in 0.5% NP40, 150mM NaCl, 50mM Tris) and matrix (Dynabeads) for 2 hours at 4°C. 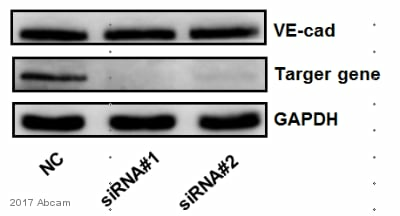 For western blotting a HRP-conjugated mouse anti-VE Cadherin (1/3000) was used to confirm successful immunoprecipation. Publishing research using ab33168? Please let us know so that we can cite the reference in this datasheet.